"This photo was taken of the snare line warming up in Madison, Wis., last year on the day of Division I quarterfinals -- our first day as a Division 1 corps. From left to right is Teddy, Jordon, Andy, Burton, John, me and Scotty. These guys are my best friends, and I had so much fun marching with them. 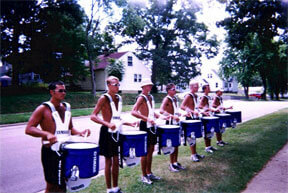 They made my first year in drum corps truly memorable." Thanks Will! View the Forzato archives E-mail your Forzato submissions to dave@dci.org along with where and when the photo was taken, and send some biographical information about yourself as well. We'll give you full credit. Also, let us know if you want your e-mail address included, to get feedback from other drum corps fans.